I have a very hairy German Shepherd called Raffa who is now 12 years of age. Unfortunately when he was approximately 2½ years old, and in the care of someone else, he was injured which resulted in him having damage to his back end/legs. When I realised what had happened to him I took him to live with me permanently so that I could care for him as best as I could. A couple of years after Raffa came to live with me I had him examined from the tip of his nose to the end of his tail at Prospect House Vets and we discovered the full extent of his injuries to his back legs, spine and ligaments. After Raffa was injured he learnt to walk by crossing his right leg over his left, to the centre of his body, to take his weight. At that time it was suggested that Raffa would benefit from hydrotherapy and acupuncture sessions. I already knew that these holistic therapies would benefit Raffa’s condition so I was taking him to appointments for both regularly. One of my close friends Lynne had been taking her 2 dogs to North Wales Canine Hydrotherapy and she had suggested that I take Raffa along. On the first trip Raffa was lead into the pool and with the bonus of a tennis ball to play with, he took to it immediately. I watched his every move, worried that he may not like it or that he wouldn’t be able to swim with the damage to his back leg. His left rear leg is the damaged leg, and as I watched Raffa swim I noticed he was not able to extend that leg fully when he was swimming. It took a while to get Raffa out of the pool as he was having such fun, it was fab to see him so happy. When he gets in the water he is so excited, we call him Raffa McSplashy, as what he lacks in technique he more than makes up for in enthusiasm. We booked sessions for every 4 weeks and every single time Raffa would get so excited to be told his was going swimming…he still does to this day. 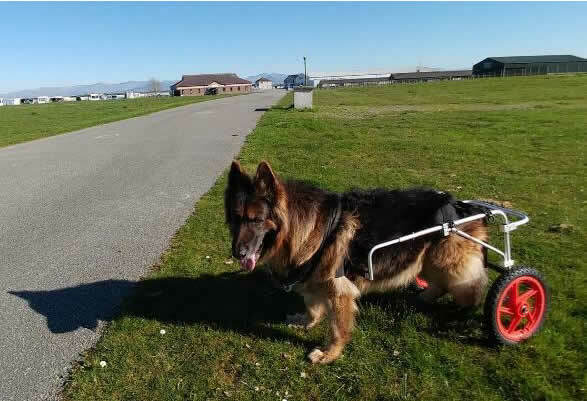 As Raffa has continued with his swimming over the years obviously his condition has worsened, he now struggles to walk unaided so we have purchased him his own set of wheels, which he took to instantly. He still goes swimming as I know it has made a big difference to him, he gets so excited and I know it has helped to keep him going to the grand age of 12. 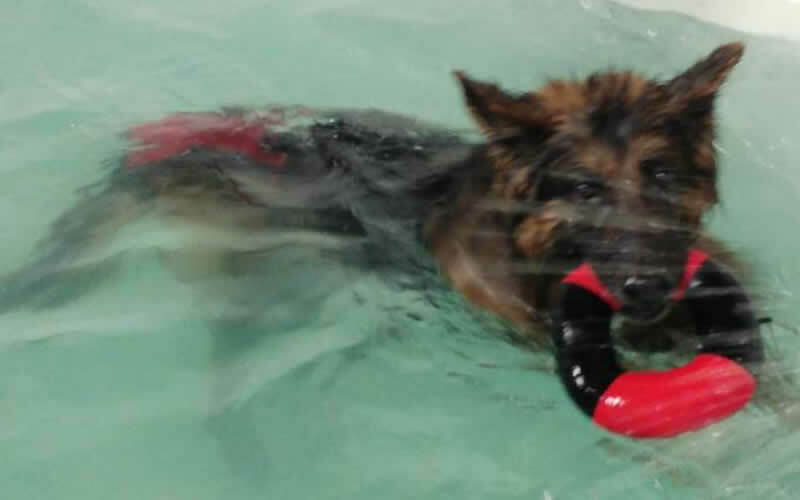 It has zero impact on his joints, he extends his rear legs fully, something that I know the swimming has helped with. The buoyancy of water supports and lessens the stress on the joints and Raffa definitely gets more out of it than walking. He plays with a toy in the pool and regularly refuses to give it up to Pauline and Tony. It helps to maintain Raffa’s fitness levels (along with 2 walks a day chasing rabbits) and to control his weight (as long as he doesn’t have too many gravy bones) and I know that it improves his quality of life. Even having part of his foot amputated last year through cancer only stopped him swimming whilst he recovered. I find that dogs are so clever at adapting to their situations. When Raffa goes swimming now he wears a rear harness to enable us to lift him in and out of the pool, he swims as well as ever and he thoroughly enjoys his swims. I can almost see the smile on his face, not only does it do his body good but it helps his mental wellbeing too. Without swimming I am sure Raffa would not be as healthy as he is today.